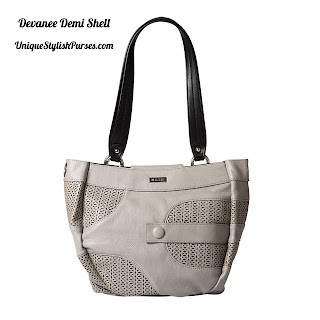 Sophisticated yet fun-loving, medium-grey Devanee for Demi Miche bags is a delightful addition to your collection. Unique abstract design features perforated piercings, laser-cut to perfection, along with solid faux leather detail and matching covered button accent. Devanee pairs perfectly with our Interchangeable Handle Straps (grey). Back zippered pocket.